the pink toque. a craft blog: Happy First Freebie Friday! Yay for my first "Freebie Friday!" I've decided to start a promotion on my blog called Freebie Friday. The idea behind this promotion is to help keep me on track to give away at least one freebie a week -- on Fridays. Now I know what you're thinking, "But Lesley, you've given away several freebies this week! What makes Fridays special?" Well, this week has been an exception to the norm because I've had lots of time to create a lot of freebies, but I'm trying to be realistic and think long term. Life tends to get busy and I know there will be weeks where I don't have as much time and am not able to make as much. I'm also a little craft ADD and do a wide variety of crafts here on my blog besides just digital scrapbooking so one week might be just spent knitting. (especially with colder months just around the corner.) But by starting this promotion, it'll help ensure I have at least one digital scrapbooking freebie a week to give away, even on the busy weeks. So while there might be multiple freebies in the same week, Fridays will be guaranteed. Or at least that's my personal goal. 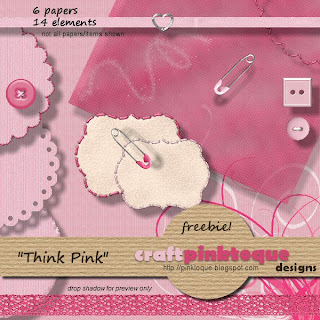 To kick off my first Freebie Friday, I have a little mini pack for you called "Think Pink." What better way to start a freebie promotion on my pinktoque craft blog than with something pink? You can download it HERE. Some freebies will be big, some will be small, but there will always be something to give away here on Freebie Friday to keep you coming back for more :) And if I find time to squeeze in extra freebies in between, even better! Thank you! Your blog post will be advertised on the DigiFree Digital Scrapbooking Freebie search engine today (look for timestamp: 09 Aug [LA 01:43am, NY 03:43am, UK 08:43am, OZ 06:43pm] ).